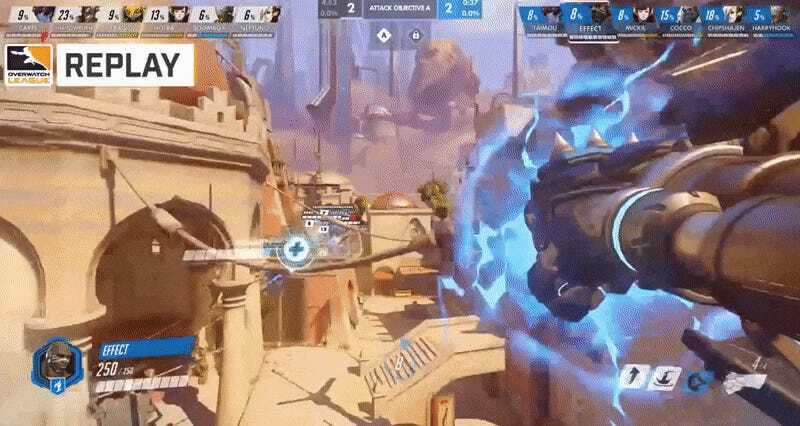 This Doomfist play, which Dallas Fuel star DPS player Hyeon “Effect” Hwang pulled off against Philadelphia Fusion in an Overwatch League match today, is nuts—the kind of thing regular players will be attempting for weeks to come. In the end, however, it failed spectacularly. At this point, Dallas Fuel’s out-of-the-arena troubles are well documented, but they’re also an intensely frustrating team to watch play. When they’re feeling loose and confident, they’re one of the most creative teams in the league. Even when an aggressive team like Philly is pressuring them with trash-compactor-like efficiency, they show flashes of astounding brilliance... followed by devastating lapses. Case in point: Effect’s Doomfist play. On the match’s second map, Temple of Anubis, Effect used Doomfist, a hero seldom seen in the current OWL meta, to scale Anubis’ dang face and cannonball straight into Philadelphia’s otherwise air-tight first point roof defense. Philadelphia’s players went flying like water from a kiddie pool, and Dallas was in a prime position to take the point. Then Effect fell off the roof, Dallas’ Mercy—who’d joined Effect for the dive—died, and Dallas’ team coordination fell to pieces. Philadelphia quickly regained their composure and mopped up Dallas’ scattered remains. The match, which Dallas went on to lose 0-4, was characterized by a number of similarly frustrating moments from other players. For every terrifying burst of offensive artistry from Dallas’ Timo “Taimou” Kettunen—like when he took out master Tracer player Jae-hyeok “Carpe” Lee without even blinking while an ulting Winston stampeded at him—there was a questionable placement that made Dallas’ crucial supports Mercy and Zenyatta easy pickings for Philadelphia’s notoriously aggressive DPS players. In the end, Dallas spent more time (and precious, precious ults) trying to claw their way out of holes they’d dug themselves into than on meaningful pushes against Philadelphia. Dallas’ matches are never boring because you’re guaranteed at least one or two moments of gleeful, impossibly skillful madness, but they’re pretty much always infuriating because this team still hasn’t figured out how to put it all together and play to their potential consistently. At this point, Dallas’ record for the season stands at one win and six losses, putting them near the bottom of the overall standings. It’s been a heck of a fall for a team that was regarded as one of the absolute best at the league’s outset—from the roof to the proverbial floor. I imagine the only people more frustrated than Dallas’ fans are Dallas’ players.